Results: While being stuck in commuter traffic seemingly is a mundane part of daily life in the United States, the consequences of losing access to these vital transportation arteries all together could be disastrous to the nation’s economic security and even public health. Today, government organizations responsible for protecting this infrastructure are doing so using static traffic models that consider a mere snapshot of the transportation network at a single point in time. As part of research being conducted under PNNL’s Asymmetric Resilient Cybersecurity initiative, PNNL scientists Sam Chatterjee and Mahantesh Halappanavar with co-authors Venkateswaran Shekar and Lance Fiondella from the University of Massachusetts devised a new paradigm: a quantitative approach that can assess a transportation network’s susceptibility to disruptions with methods from dynamic traffic simulation. The approach also can prioritize critical links over time, aiding network defense to reduce vulnerability and increase resilience. Sam Chatterjee and Mahantesh Halappanavar (inset) teamed up for yet another HST award. Enlarge Image. 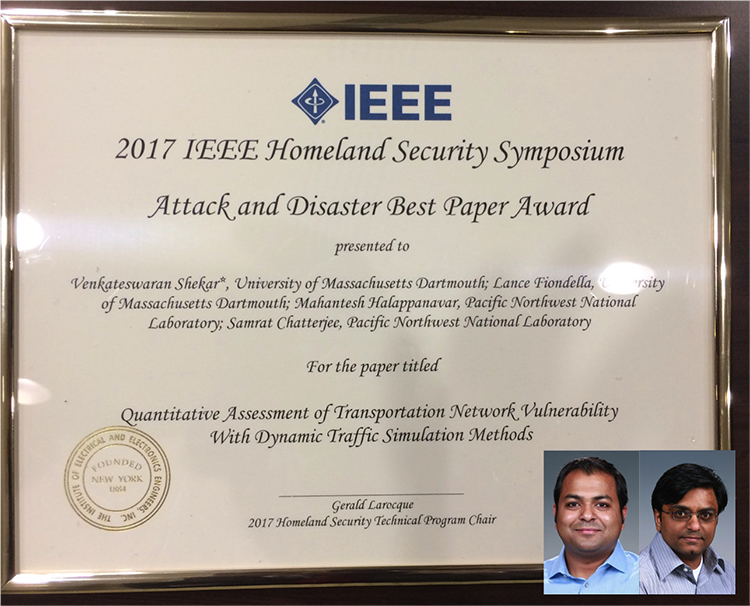 The team’s work in “Quantitative Assessment of Transportation Network Vulnerability with Dynamic Traffic Simulation Methods” was honored with the Attack and Disaster Track Best Paper Award at this year’s IEEE Symposium on Technologies for Homeland Security (HST ’17) held in Waltham, Massachusetts in April. Why it Matters: By considering the vulnerabilities of transportation networks in a dynamic simulation that accounts for their overall variability, federal, state, and local authorities can better inform how they examine potential threats and risks to these critical infrastructures. Thus, they can improve their methods for preventing, mitigating, responding to, and recovering from man-made incidents and natural disasters that potentially could affect transportation networks and lead to devastating social and/or economic consequences. Methods: In their work, the authors describe using the open-source traffic Simulator of Urban MObility, or SUMO, which allows programmatic interaction with the transportation network during simulations. SUMO was fed data from OpenStreetMap, an open-source, crowd-sourced world map. They created code that engaged SUMO to quantify the impact of temporary link disruptions and assess their criticality for network vulnerability. They applied their vulnerability assessment algorithm to various road networks, including the real-life scenario that played out when UMass Dartmouth was evacuated after the Boston Marathon bombing. In their evaluation, the Dartmouth campus featured one primary point or ingress/egress: the north entrance, leading to a circular road with 10 parking lots along the road’s interior (noted as P1–P10 in their analysis). Because of the “ringed” nature of the road, any single point of disruption along it means that drivers must reverse their direction to reach the campus exit. They examined 12 scenarios, where “links” connected to the road were disabled in both directions at three different time intervals (noted as S1–S12). 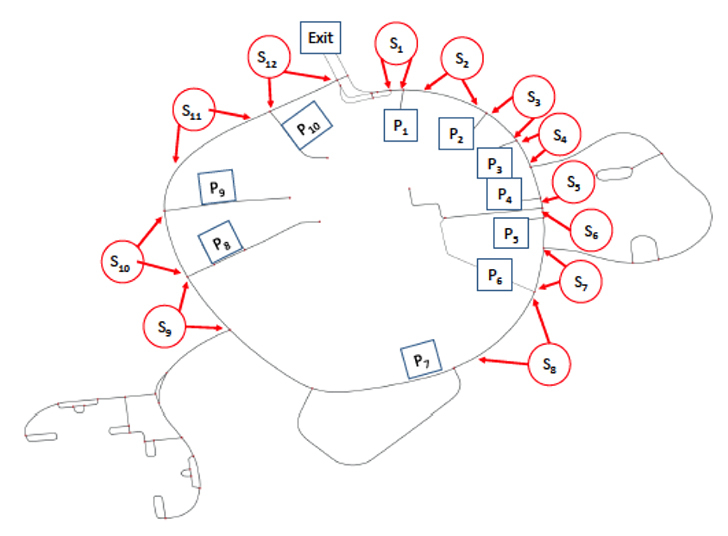 Their analysis determined that both the lower (S1) and higher (S12) scenarios, where the links were closest to the exits, bore the most impact because encountering a disruption forces drivers to reverse course and traverse the entire distance around the ring in the opposite direction. However, they also used their model to determine that evacuation time expedited when other linked areas were disabled. An illustration of the University of Massachusetts Dartmouth campus route considered in the paper. Enlarge Image. What’s Next? The team will continue improving their dynamic network vulnerability assessment method, examining practical strategies to manage scalability challenges posed by their added complexity with the aim of making the simulation more useful in multiple scenarios, including emergency response, traffic rerouting, and mass evacuation. Research Team: Venkateswaran Shekar and Lance Fiondella, both from University of Massachusetts, Department of Electrical & Computer Engineering, with Samrat Chatterjee, National Security Directorate Operations Research team, and Mahantesh Halappanavar, Advanced Computing, Mathematics, and Data Division, Data Sciences group. Shekar, the paper’s primary author, completed the work while working as summer intern at PNNL. Notably, Chatterjee and Halappanavar also were co-authors of “Quantifying Mixed Uncertainties in Cyber Attacker Payoffs,” which used game theory to mathematically address cyber-system security and resilience challenges with added uncertainties. It earned the Cyber Security Track Best Paper Award at HST ’15. Acknowledgments: The work was supported by PNNL’s Asymmetric Resilient Cybersecurity initiative. Shekar V, L Fiondella, S Chatterjee, and M Halappanavar. “Quantitative Assessment of Transportation Network Vulnerability with Dynamic Traffic Simulation Methods.” Presented at the 2017 IEEE Symposium on Technologies for Homeland Security (HST ’17), April 25-26, 2017, Waltham, Massachusetts.